Replies: 503 (Who? ), Viewed: 309129 times. This is a total rewrite of the MeshTool tutorial first created by WDS BriAnna over a year ago. Too many things have changed in SimPE. Thank you BriAnna and Windkeeper for helping get so many of us started! And thank you Snowstorm for the tips on how to gather the mesh pieces. Meshing is DIFFICULT. There are a lot of steps. Even experienced meshers sometimes have meshes not show up right, explode, or do other fun things. This is a very complete tutorial, don't rate it poorly just because it didn't work the first time you tried. Unless you really don't want to see any more tutorials on site. 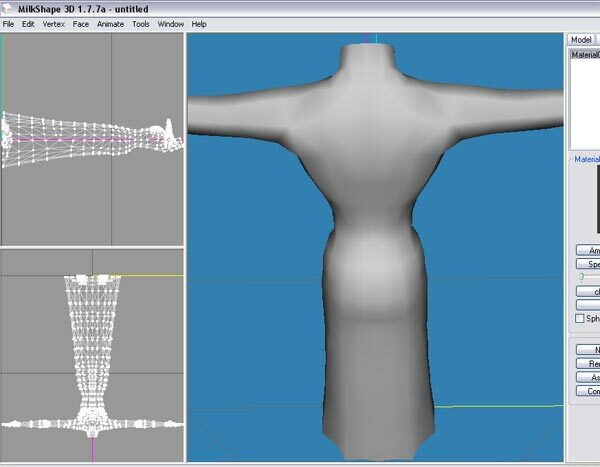 This tutorial will guide you through ALL the steps involved in modifying a body mesh for Sims 2. You must always start with a game mesh as your base. 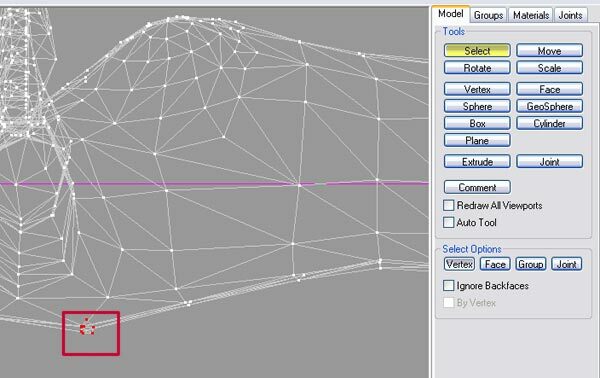 This uses the simplest of tools – MeshTool, to allow for the changes to the mesh. 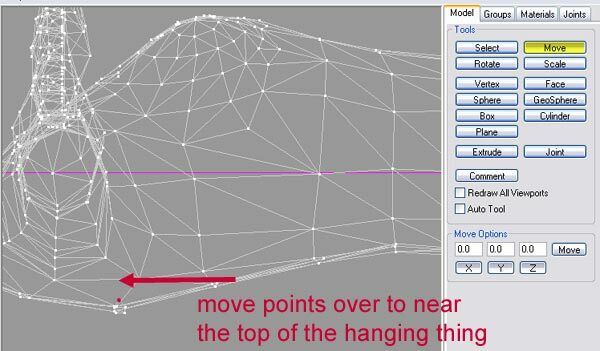 Because of this, you cannot add or delete points on the mesh, but you can move them. You can change the width of sleeves, make a skirt a bit longer or shorter, or give the sim larger or smaller proportions. Your modified mesh will get fit and fat in the game. 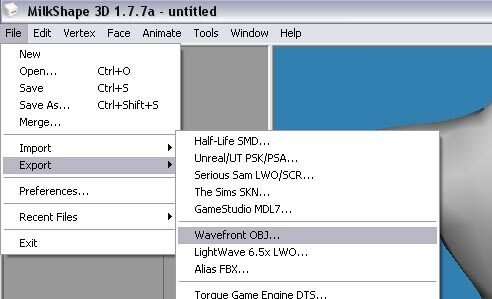 Meshtool appears to NOT work correctly with Maxis meshes that were released with Nightlife and above. You'll need to use the Unimesh Tutorial instead. Hopefully someone will be able to fix this. Also you will need Unimesh if you want to add or delete points on your mesh. While the modifications allowed with this are fairly simple, 90% of the steps you will learn here to modify your mesh are the same used with other tools to modify meshes. Meshtool: http://www.modthesims2.com/showthread.php?t=45457 SimPE (.58) or higher http://sims.ambertation.de/ Note that SimPE is regularly updated/improved, so please always get the newest one, unless otherwise indicated here. SimPE .58 actually had a fix for body meshes. If this is your first time getting SimPE, make sure you download and install all the stuff they list at: "Needed Software to run SimPE". If you don't, you'll get errors or blank screens when you try to do parts of this tutorial and be unable to complete your project! And you will need time and patience. 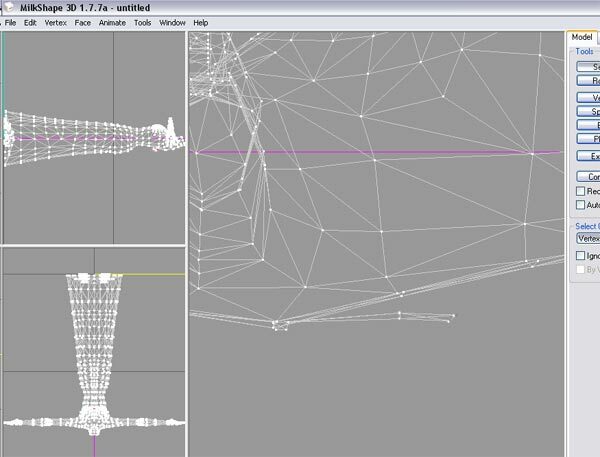 There are a lot of steps to modifying a body mesh. Even experienced meshers sometimes have to redo part of their work, so take your time and relax. Modify the women’s long gown to no longer have the hanging decoration on the back. 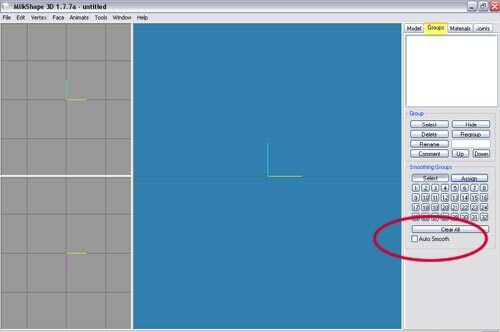 And learn all the steps needed to make your own mesh file and get it working in the game. 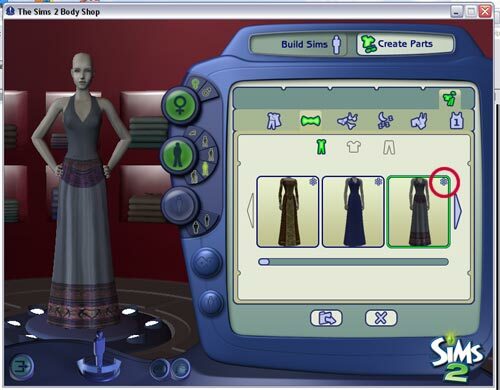 1) Run Bodyshop and choose an outfit you’d like to modify. (Create Parts/Start a New Project/Create Clothing/Formal) In this example, we’re going to use the formal woman’s gown, and take that odd hanging thing off the back of it. We’re going to pick a name we can find, and as this is only a temporary texture we’ll be using, let’s name it “MeshTutorialTemp”. Import it into your game, use any tooltip and category you wish, I’m going to leave it as a formal. Close Bodyshop. 4) Look for the property set (it will be dim, in the second column). There you will see the name of the mesh. In this case afbodydresslongloose_grayline. The important part of this is the ‘afbodydresslongloose’, you can ignore the ‘grayline’ part. 7) Use the Finder Tab (it should be on the right edge or the bottom of the screen, if you can’t see it, try the menu Window – Resource Finder) and put in the name “afbodydresslongloose” and hit the Start button. SimPE will chew on this for a while, there will be a green bar updating at the bottom of the screen. This was really slow on my system, now might be a time to get up and stretch or grab a glass of water. 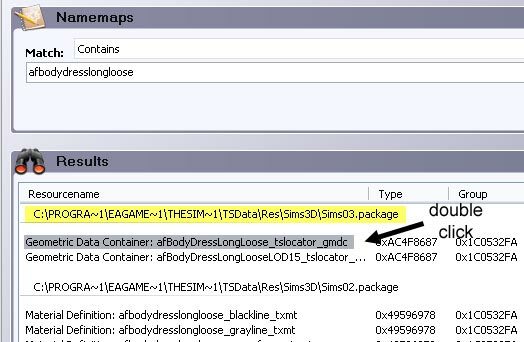 8) We’re going to look for our mesh parts in 4 files; The GMDC from the Sims03.package, the GMND from the Sims04.package, the SHPE from the Sims05.package, the CRES from the Sims06.package. Scroll down until you see the Sims03.package file. 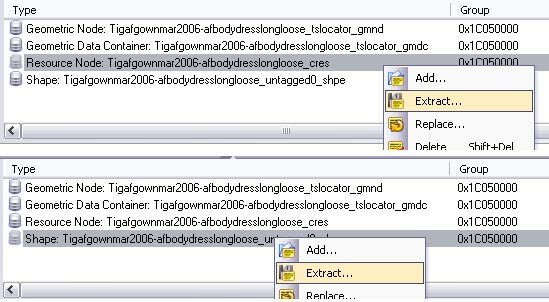 Choose the GMDC by double clicking on Geometric Data Container: afbodydresslongloose _tslocator_gmdc. You do not want the LOD version. Wait for a bit (the gmdc is slowest to load) and the green bar will do it’s thing twice. 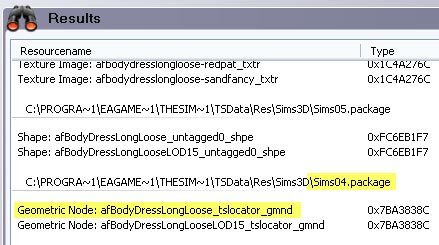 10) Click on the ‘Finder’ tab again, and look for Sims04.package, and find the Geometric Node: afbodydresslongloose _tslocator_gmnd. Double click on it. 12) Repeat steps 10 and 11 two more times looking for Sims05.package with Shape: afbodydresslongloose_untagged0_shpe, and Sims06.package with Resource Node: afbodydresslongloose_cres. Extract them to the same directory. 14) Right click on the empty window with the heading ‘Type’ and select ‘Add’. Select one of your files, then right click and add again, until all 4 files are shown. 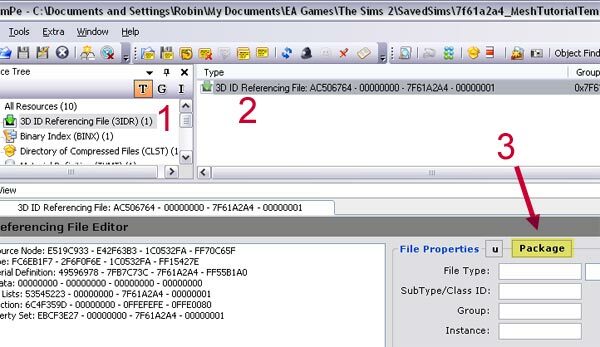 Save this file into your “My Documents/EA Games/Sims 2/Downloads” folder. 17) A box will pop up. Type in a unique name for your mesh, for example, the filename. Click on Update. 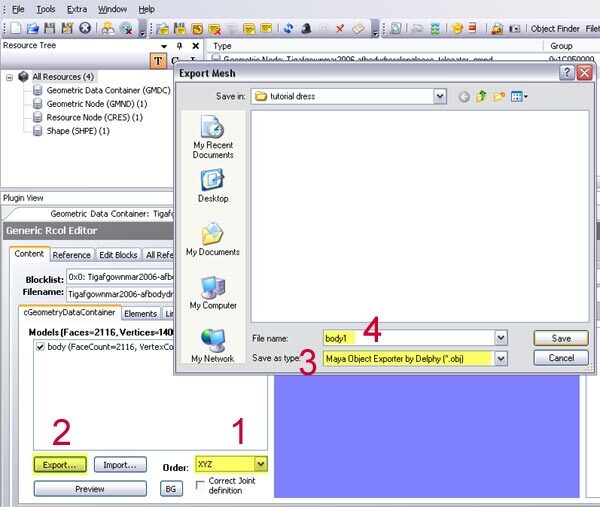 Then click on OK.
19) Save your new Resource Node (CRES) and Shape (SHPE) files to your project folder by Right Clicking on each and choosing 'Extract'. Give them the name ‘modifiedcres’ and ‘modifiedshape’, so you can tell them from the originals. 21) Right click on the packed files window and use ADD, and add your modifiedcres file. Right click again and use ADD and add your modifiedshape file. 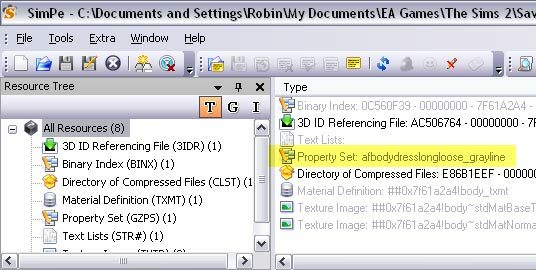 22) Go to the 3D ID Referencing File (3IDR). Click on it in the left window, click on it again in the right window. In the plugin view tab, you will see a button that says Package. Click on the Package button. A window will pop up. If you don't see any information at the bottom half of the screen (and thus no Package button) look for the 'plugin' tab at the very bottom or right side of the screen and click on it. If you can't find it still, go the the Menu 'Windows' and select 'plugin'. 23) Drag your shape and resource node from the popup window into the list on the left. You will now have two shapes and two resource nodes. Close the pop up window. 24) Click on the resource node at the top of the list and delete it by clicking delete. Click on the shape at the top list and delete it. 25) Move your new shape and resource node from the bottom of the list up to the top by clicking on the name, then clicking the UP button. When you’re done, the Resource Node should be the first entry, and Shape the second. 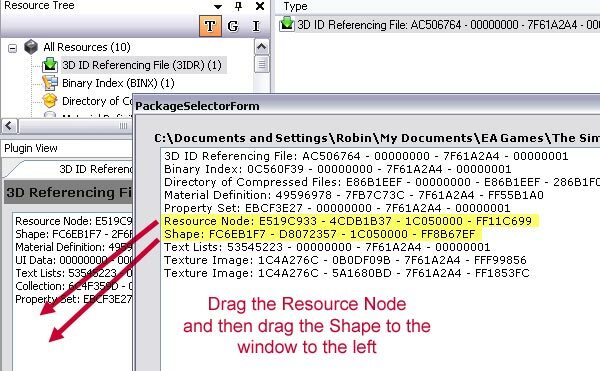 27) Delete the Resource and Shape from the Packed Files list by right clicking on them and choosing delete. A line will go through them. Then SAVE. 28) Now is the time to test to see if you still have a working package. Start up Bodyshop. Click on Create Parts - Create New Clothing. Look for the dress in the category you chose (most likely formal). Your recolor will have a ‘*’ in the corner. Click on it. If the dress shows up on the mannequin, then so far so good. If you see nothing, or it changes to a different outfit, you might need to try repeating Part III or Part IV over again. You should now quit bodyshop, all you needed to do was click and see the texture on your mesh. Without any changes to the mesh, it’s hard to know for sure if you’re viewing your new mesh, but so far it looks good. In the future when you check your mesh this way, your new shape will show up on the mannequin, although the thumbnail (the small picture) will be unchanged. So you’ll be looking for this same thumbnail. Next it's time to edit your mesh. Go to the next message for the rest of this tutorial. Last edited by tiggerypum : 19th Dec 2006 at 11:10 PM. 29) Open your mesh file with SimPE. 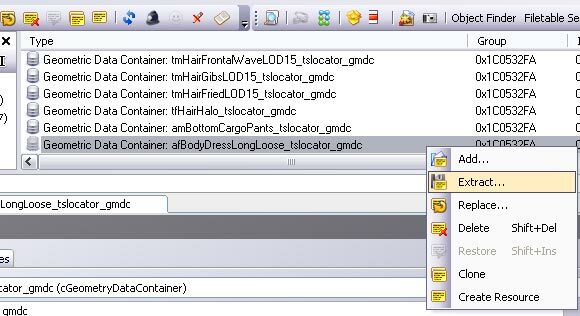 30) Click on the Geometric Data Container (GMDC), make sure the settings are set to XYZ, and click the Export button. 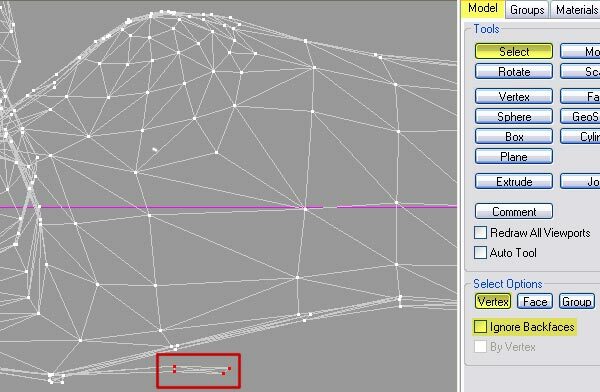 Remember that with this OBJ format, you cannot delete or add vertices to your mesh! 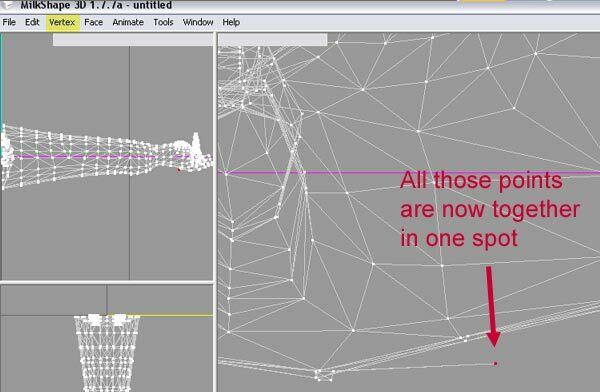 You can only move them - and you cannot move them past joints (like make a short skirt long) because your sim will not animate correctly. 35) You will see your mesh in the windows with different views. The mesh will be laying down. If you don’t see 3 windows, you can change that by going to the Windows Menu and selecting Viewport – 3 Window (2 left, 1 right). 36) Now move the view of the mesh so you see the top of the dress by holding the CTRL key and pressing the left mouse button and dragging it in the big window. 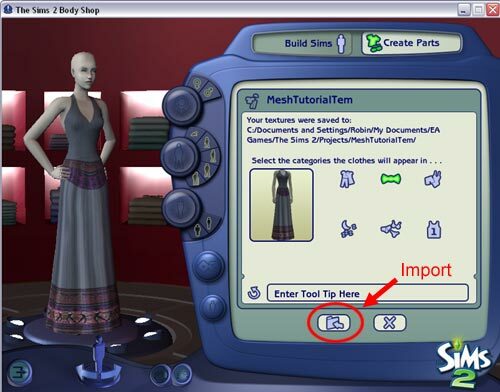 37) Now zoom in by holding the SHIFT key and left clicking and dragging in an upward motion, until you get a good view of that thing on the back of the dress. 38) Click the Select button in the Models Tab. Make sure ignore backfaces is unchecked. Make sure vertex is pressed. 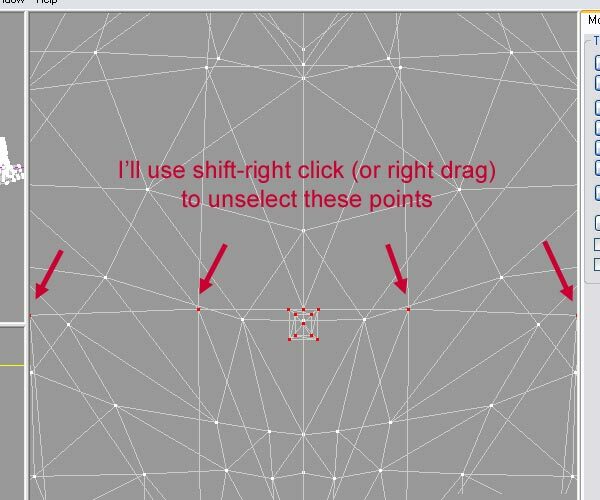 To select points click and drag over them. To select more points, shift-click drag. To unselect points, shift right-click drag. I’m going to select the pieces on the part that is hanging down first. 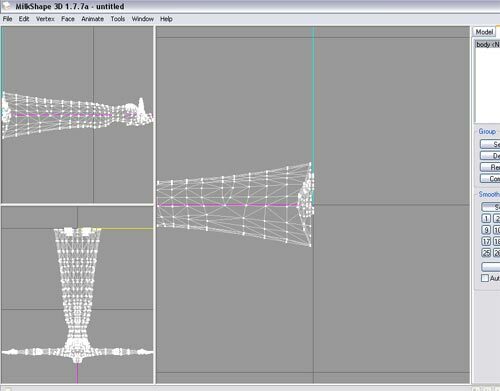 39) Now I’m going to have all the selected vertices collapsed down to the same spot – making most of the faces disappear. I’ll use menu Vertex – Snap Together. 40) Now I want to move the points (it looks like one, but it’s the whole set) up to where the rest of the points are at the top. Click the Move button, and then slide the point over to the left with the mouse. 41) Now all the points are very close to each other, so I’m going to try and select that whole top section (my intent will be to collapse them all, but I better check what I selected before I do that). So click select, and select that block of points. 42) Now check if points you didn’t want got selected. Unclick the Select button. Right click on the window with the mesh and select ‘Projection – Bottom’ (which will show you the back because the model came in laying on its back, not upright). Right click on the window and choose ‘Frame Selection’. Now we can see that I selected some points that were not on that center thing – be sure to look at the very edges, it looks like I’ve selected 4 points I don’t want. I’m going first make sure that the Select Button is selected, and then hold SHIFT and right-click and drag over the 4 points I don’t want selected to unselect them. 43) Now that it looks like I only have that center piece, I’m going to use menu Vertex – Snap Together to bring them all together in one spot. 44) I want to check carefully how the mesh is going to look. I’m going to unclick the Select Button, and then right click on the window and select Smooth Shaded, Projection 3D, Frame all, and then the menu Edit – Select None. Now use the mouse to move the mesh around and check how it looks. Looks good. 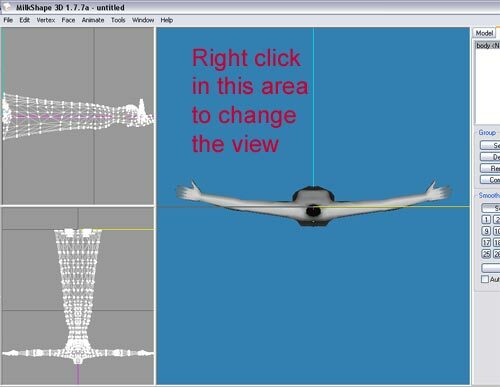 48) Click on ‘Load 3D File’ and load your new obj file (body2.obj) Click OK on the info box. 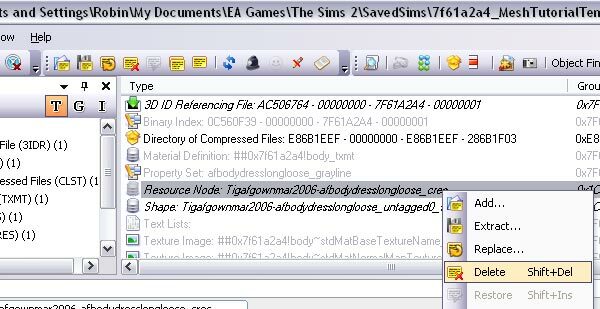 49) Click on ‘Load Sims 2 Mesh’ and then find the original gmdc file you had saved, long ago at the beginning. You might need to change the filetype from ‘simpe’ to ‘5gd’ so you can load it. It will have a long funky name, like AC4F8687-1356E054-1C0532FA-FF300D1E.5gd. It will be the only 5gd file you have in your working folder. 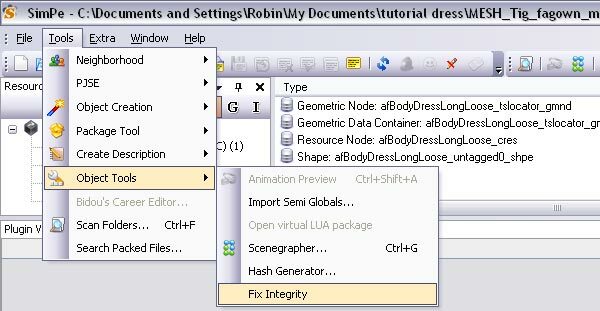 There are also options that you might need to try or change, depending on what program you edited your mesh with. In this case, with Milkshape, I didn't change any of them. 50) Click on ‘Save File’ and give it a name like ‘newmesh1’ (this way you if you make further changes, you can use newmesh2, etc). Close MeshTool. SimPE will pop up a box saying ‘Resource Changed, should SimPE reload it’. Click Yes. 53) Now SAVE your new mesh file. Quit SimPE. 54) Now test if your new mesh works in bodyshop and in the game! I am not sure if the Milkshape rounding error still happens, I did not notice it on my test mesh, but maybe I didn't look carefully enough - if you notice a tiny gap at the top of the neck, go back and edit your mesh - select all the vertices on the top of the neck with the select tool, and then hit move and move them upwards just a tiny bit. If your work did not show up in bodyshop, or does not look like you expected - there is a Frequently Asked Questions / InfoCenter forum here at MtS2 that you should check, many of the basics are covered there. You might also try the tutorial again, and can ask for help (be as specific as possible) here in this forum. Part VII - You're done! You rock! Now you can go back to body shop and create new outfits for your modified mesh. Simply start a new project and recolor the 'temp' outfit, and it will use your new mesh. Once you've made a new recolor, you can delete the original (numbers)MeshTutorialTemp.package. If you wish to share your new mesh here at MtS2, please look at the creator guidelines in the downloads area, take the time to make a nice recolor for your new mesh, and get some good in game screenshots of your work to show it off. I hope you enjoyed this, and have fun making your own creations. It does get easier each time you do it! And if you found this tutorial helpful, you can scroll back up to the end of the first message and click that little 'thanks' button, I'd appreciate it. Last edited by HystericalParoxysm : 25th May 2006 at 8:55 AM. Not yet, going to give it a bit of time for all the dust to settle and any unclear spots to be refined. But you can print it these pages as they are, or you can tell your browser to 'save' these pages to your hard drive, so you can look through them if you're on the web or not. There's a lot of pictures, it will be challenging to create a small download. HI Tiggerypum - click FILE and SAVE PAGE AS. Put the title of the page as the name of the HTM file. the save feature will place all the associated files in a subfolder. Yes senicynt, that is indeed how anyone can save an html file to their hard drive for further reference. I'm not going to at this time build a separate download (which people will then click on again to download), nor will I likely make the 'download' a set of html files, although I could. Englisch is not my first language, so forgive if i'm not clear. I have a question about point 15. Is it right that the format name is that line under where you can wright the file name in the popup screen "save package". I couldn't find "MESH_yournick-agesexmeshname-date"
I took the first one. I'm also stuck at point 23. But maybe that is because of what i did at 15. It believe you did step 15 correctly, and I have tried to expand that set of directions to be clearer. You make up the filename, and it should have saved it out as a package. At 23? Maybe you missed something in step 22? I illustrated the 3 spots to click, but I realize the text is very brief. I'll try to expand that text and I hope that helps. I've seen what i did wrong, It was at 22. I had to click on 3D ID Referencing File by "All resources"
And now i can follow the rest. eacz, what you posted isn't really any sort of question that can be answered. I'm having trouble at step 28. When I upload the outfit, the mannequin's fingers (one on each hand) get all deformed-looking and stretched out. I decided to ignore it and go on, but whenever I clicked on the Geometric Data Container, a little pop-up comes up. It says "File or assebly name Microsoft.DirectX, or one of it's dependencies were not found." That came up once before, too. Is there any way to fix it? Lillerzini, exactly which dress did you use, and which EPs do you have? Maxis changed the bones in the fingers and added an extra assignment (now we're getting technical) to some of the nightlife meshes (not sure about ofb meshes). If you try the *other* tutorial that's almost identical to this one that uses Unimesh. (you can still use the same meshfile you built). You'll see that the whole first message of instructions is identical. The 2nd message explains how to edit it with Unimesh instead of Meshtool - please try that and let me know if that solves the problem. I'm also asking a programmer to check and see if indeed there is something in meshtool that needs updating. I need help with number 30 because when i click on it it brings up a window that says error file or assemblies of direct.x were not foundor one of its dependicies were not found. waiting for my chance to break through, my chance to live again. what it takes to make this dream come true, we'll be here till the end. The first dress I used was just a regular TS2 dress, the second was an apron from Open for Business and the third was from Nightlife. I have all of the expansions. Thank you for the help! I'll go try out the other one. <(V,V)> XYZ..... XZY.... it really all looks the same to me... Thank you so much for bringing it to my attention more though... That was indeed the problem. Which also explains why in your window the model was lying flat and standing in mine <(^,^)> so we've effectivly killed two problems with one big blunder. Now maybe I can be on my way to making Hinata Hyuga <(O,O)> hah ... Never hurts to dream. Thanks so much again. I can't find the export button. What can I do? Step 30? Did you click on the Geometric DATA Container in the top windows? The bottom of the screen should show the plugin view, which is slightly obscured by the popup in my screenshot. If your GDMC is highlighted and you don't see that blue box at that bottom of the screen, look for a tab at the very bottom labeled 'plugin' and click it. Let me know what you had to do to resolve this, so I can update the tutorial with more details as needed. Excellent Post, this guide is very helpful. It seems now I am spending more time in mesh, than in the game itself. One Question, how may people find it hard to work with the XYZ order than a XZY, or is it just me?